You can also just go to the drop down menu and turn off 3d. At least you can in Chrome. Thanks Grant -- I may have to try that for a while. Lite Mode disables some features that I like, but the 3D mode is too much for some of my computers to handle. I never had the option to switch to lite mode until I googled it and clicked the link at the bottom here https://support.google.com/maps/answer/3031966?hl=en (did not appear in the dropdown menu). Now I see the lightening bolt next to the streetview pegman everytime. EDIT: I wasn't using it in Earth Mode. P.S. I don't like how dark the new imagery looks. Google needs to get wise and fly their imagery in April, like right after the snow has melted, but before the trees have bloomed. The technical usefulness of the imagery is diminished by trees in full bloom. Clarification - you don't need to use "Lite Mode" to see the new imagery. You just have to manually turn off 3D every single time. The 3D rendered images are now two cycles old, as regular top down imagery has been flown twice since - late last fall and now again in March. I LOVE how frequently we get updated imagery these days. It used to be almost every two years, but now seems to be every 6 months lately. The releases come more quickly too...as others have noted, these are maybe a month old at most! Can anyone nail down the exact date? Also, kudos to Google for finally getting wise and flying in early spring (no leaves on the trees). It may look ugly and brown, but the imagery is so much more useful. You need to be using the downloaded version of Google Earth. According to the desktop version of the Google Earth app, it is from March 11, which was a Friday, but I am seeing nothing but 2-car trains on the light rail lines, so I'm skeptical. maxbaby wrote: You need to be using the downloaded version of Google Earth. Nope. 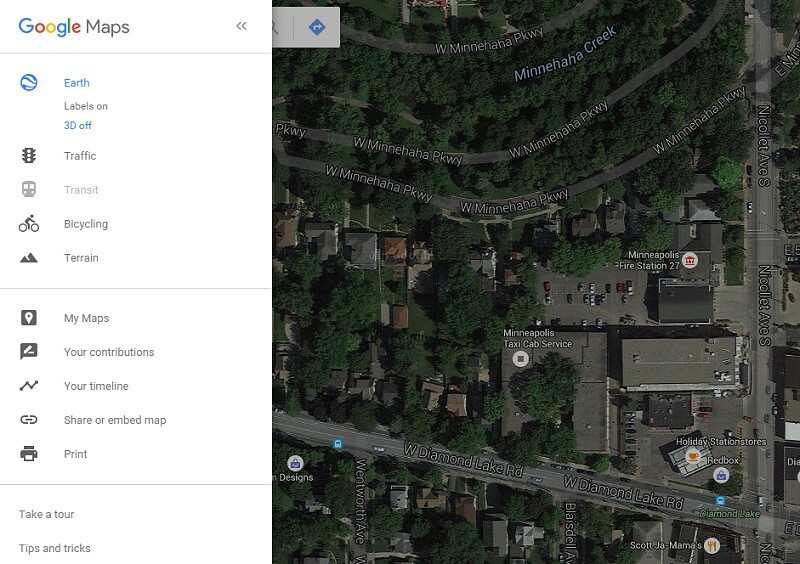 I saw the new imagery in browser-based Google Maps. I see the updated imagery in my iPhone. Wow the Wells Fargo signs on top the buildings downtown are so clear to read. The new imagery shows the neighbors' addition on their house but not the new siding on their garage so mid-March-early-April sounds right. Hilariously, street view still shows the old siding on our house. That was two years ago. My street view is 2 1/2 years old. Me building my paver sidewalk is frozen in time. Google Earth Pro is apparently free now (and has been for a year). Waaay better than their browser-based mapping tools. We took the cover off the water feature March 31st, it's still in the aerials. Waze (owned by Google) is causing cut through wars in neighborhoods that were once quiet public streets. You know, when self-driving cars match up with omniscient redirecting, we might really have a damn good reason to get residential neighborhood street speed limits in Minnesota reduced to 20 mph. I prefer the built in Apple Maps. It's been all I need, I never have need of turn by turn voice directions, or live social reporting of crashes and closures. And for many of the reasons in that article, I prefer the choices being made in what info is presented. Back in December, use counts found Apple Maps was 3x more popular than Google Maps on iOS. A lot can be said for being a default choice that is "good enough".